This is a 2 day outdoor learn to lead climb course. This is a popular course for people who are ready to take the next step from top rope climbing or lead climbing indoors on to the real rock! Or people who have started out climbing with a friend and would like to extend their knowledge and skills from a qualified rock climbing instructor. 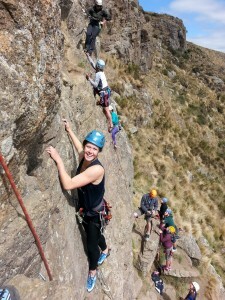 This course is also suitable for people working towards a NZOIA (new Zealand Outdoor Instructors Association) Rock leader or NZOIA Rock1 instructor awards. 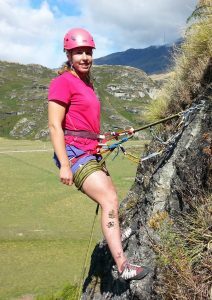 Our lead climbing courses are delivered in Christchurch. We meet at Albert terrace in St Martins, Christchurch on the first day. From the road end the climbing area is just 5 mins walk. Day 2 the location will be decided by the group and your instructor. We often use Cattlestop climbing area , pop up climbing area and Rapaki Rock on the top of the Port Hills (30 mins from Christchurch city center) for the second day. R U TRAVELLING FROM OUT OF TOWN? Lots of people travel to attend our rock climbing courses and we like to make it easy. We off a free pick up/drop off service for people for people traveling from out of town from the airport and Christchurch city centre accommodation. Talk to one of our friendly team about our pick-up/drop off service. Rock climbing courses run from October to May. visit our Course Calendar for scheduled course dates. Custom courses and private training can be arranged on alternative dates by request. Loads of time spent climbing! Rock climbing and abseiling courses run from October to May. visit our Course Calendar for scheduled course dates. Private training & Custom courses can be created on alternative dates by request. *Advertised price is the early bird discounted price.